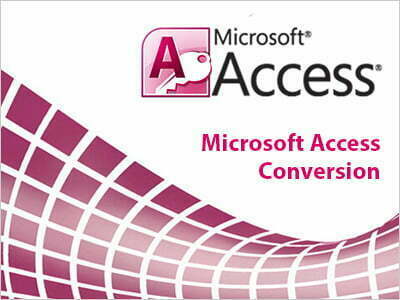 Microsoft Access has been a very popular platform for building database driven applications for small businesses, within departments of large corporations, and by hobby programmers to create ad hoc customized desktop systems for handling the creation and manipulation of data. But Microsoft Access does not scale well. If data is accessed via a network, and/or used by more than a handful of people, latency and errors are common as it must rely on a Client-Server solution. Access is simply not designed to take up enterprise wide functionality nor is it capable of managing huge amounts of data that most companies require. The migration of MS Access database to a web based solution is natural progression. We at Pulse Solutions specialize in porting applications from legacy databases to powerful and scalable web applications removing all limitations, freeing network resources, making solutions scalable and user-friendly web applications. Information gathering: Client input is vital throughout the process. Feedback is gathered as to the current functionality, data flow and upgrades required. Data structure upgrade: Pulse database architects take your Access based database to normalize it for performance and upgrade the structure to the latest database standards, Usually MySQL 5 or MS SQL 2008 is used as the new backend. User GUI: The Graphical User Interface is designed to mimic the access functionality as far as possible with the addition of new features and better usability. Technologies like AJAX and XML play a major role in the reconstruction of the application interface for maximum performance. Code development: The complete application is written from ground up using the existing work flows and schematics from the existing database as needed. Professional 100% managed code is written either using PHP 5 or .Net 3.5. The code quality will be certified by Pulse test engineers and a complete test case report would be submitted with the application. Live Data Upload: Data from the current access database is imported into the new structure. This is the most crucial phase as all of the old data needs to function seamlessly in the new application. Experienced database architects execute this operation to ensure all of the data is imported accurately. Documentation: A detailed help manual is created to assist the client and his staff to get accustomed to the application in the quickest possible manner. In some cases we create flash based animations to explain how the application works. Go Live: The access database is abandoned and the web application takes over, the system is either hosted internally or on a professional host. Go live includes a final regression test of the system and a hand over of code rights and all other materials developed exclusively for the client. 3C-Leisure is a premier exercise equipment retailer in the UK, with 10 websites they simply couldn’t manage with the Access based application written by the in-house staff and needed a more powerful system to integrate their websites and warehouse for accurate stock tracking and shipping estimates. Image-Specialists Inc is a large ink manufacturing company with products compatible with 1000s of printers and ink cartridges. The system was custom built from ground up as there was absolutely no precedence of a software that could do the complex algorithms and reporting they needed. CBE has a database of 100s of Publishers exhibiting 1000s of publications, An Access database driven application had served them well for years but it was apparent that the application was becoming a bottleneck for employee productivity and the limitations were directly affecting business growth. Pulse Solutions built a system for them that rivals the best out of the box system and does exactly what they need, the system is not only versatile its simple to understand and operate. CRM and Project Management system – PDA Enabled ! Dera Food Technology is a multinational company based in over 10 countries , They needed a system to replace their aging access database with complete accessibility from the internet and through PDAs. At Pulse Solutions, our trained and certified team has helped companies of all sizes by building custom solutions from MS Access. This has allowed the companies to focus on what they do best instead of fighting daily with an outdated, cumbersome database.